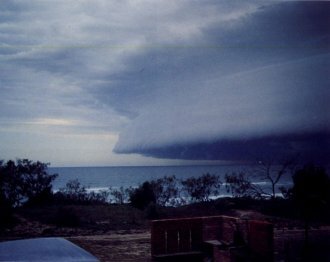 On Christmas eve, 10 years ago, SE QLD was battered by a Tornadic Supercell. The storm produced several Tornadoes, and parts of SE QLD sustained severe damage. In the city of Redcliffe 500 houses were unroofed, and 1000 damgaed. 2 people were also killed in Redcliffe, with several more badly injured. This storm initially formed along the border ranges as many severe thunderstorms do in SE QLD. The cell spawned a tornado over the border ranges before moving NE, and forming a squall line. Perhaps what was so interesting about this cell, was the fact it went into the squall line as a supercell, and then left the squall line as a supercell! Another tornado was reported in Redcliffe, it removed roofs off houses in the Redcliffe area. Damage was also reported prior to Redcliffe, this was straight line damage only. At Newport straight line winds were again reported, where yacht was destroyed with its anneometer jammed on its 100kn maximum! Tornado damage was again reported along Bribie Island (making it the third tornado from this cell), it flipped over a boat and unfortunately killed a young girl. The following details are unconfirmed - as it was difficult to track because the storm knocked the BoM radar out. But it is thought that this cell tracked northwards along the coast, and severely damaged some areas of the Sunshine Coast. It then continued to track northwards, where it hit a small town called Cedar Pocket - where yet another tornado touched down. The tornado completely removed the roof off one house, and badly damaged another. If this is true, then the cell lasted for approximately 250-300km, and lasted between 4 and 6 hours - certainly an incredible feat!!! I was never any good at English, so you can probably pick 100 grammar errors in this account, but i'm sure you'll get over it! 11 years ago on this very night, I experienced a storm with such ferocity that I have never experienced a storm even close to it since. Most weather enthusiasts would be excited at the forecast of storms on Christmas day - as I was on this day - but little did I know that the city of Redcliffe would be battered by a tornadic Supercell. I spent most of my day scanning the skies for signs of development, and I have to say that by mid afternoon I was starting to wonder if we were going to get storms! It was almost totally overcast with high cloud - which was probably anvil cirrus from storms over inland SE QLD - but at the time I just thought it was general high cloud. late in the afternoon (around 5pm from memory - I was only 10 years old!) my dad told me he was going down the road to pick something up from the shops. I hadn't looked at the sky for some time, and when I got a call from my father from his mobile phone saying "THERE IS A HELL OF A STORM COMING!" I quickly ran to a window on the southern end of the house. I almost fell over when I looked out that window! The whole southern sky was pitch black! I thought to myself, this storm is still a little way off, but I didn't know that the gust front of the storm was right above me and I was staring at the precipitation curtain of the storm! Just as my dad was driving back down our driveway into the carport at the rear of the house a huge Cg stuck very close to our house! This thing was forked and pulsed 4 - 5 times! Shortly after there was the deepest and loudest thunder i have probably ever heard! At this point I leaned further out the window, and looked up to see the leading edge of the storm right over my house! And boy did it look MEAN. Dad came running upstairs and screamed at me to shut the window, and help him shut all the windows. The rest of my family were now well aware there was a storm coming after the crack of thunder. Shortly after we finished closing the windows (all except for one! read below) the rain started. HUGE drops, and very close together. The wind at first was probably between 20 and 30 knots - not severe, but I thought to myself "this is a nice storm". But this was nothing! A few minutes into the storm things turned from nice to NASTY! Over the roar of the rain on the roof I could hear an even louder roar. Then it hit, it was like a giant wave slamming into the side of our house! winds would have been well in excess of 120-130 km/h hour! The rain intensified from very heavy to downright torrential. At this point I became quite worried/upset. I am a big fan of thunderstorms, but this was scary! When i ran to the southern side of the house to look outside, I could see nothing! It was like all the windows were painted a creamy white colour! I was becoming increasingly concerned fro the safety of my family and myself, and I ran to the back of the house. The noise of the storm was so loud that you could hardly hear anybody speaking, and as I ran to the back of the house I noticed my mum and dad at the bottom of the stairs putting towels around the window sills of a window in our foyer to stop the rain coming it! This was a reasonably old house, but the rain was being pushed up against the house with such force that it was pushing water through the TINY gaps around the window and water was spurting out all over the floor. Stop and think about that for a second! They called out for me to get more towels from the bathroom, as there was water flowing into the house from underneath the door! (we had a foyer at the front of the house that was lower than the rest of the yard, and all the water was pooling up in there - even though it had a very good drainage system!). The storm has not let up at all - it was even more ferocious if anything - and as i was listening to the sound of breaking glass from surrounding houses i have to admit I became quite upset as i thought something very bad was going to happen to us. After a brief pep talk from my dad (ie. SHUTUP and get some more towels<g>) I got more towels from the bathroom and helped them. When I walked down the stairs, my little sister walked around the corner and informed us that there was water coming in everywhere downstairs! We got even more towels and tried to stop the water from coming in (it was coming in from a gaps under sliding doors) but it was no use, and before long half the bottom section of our house was flooded with close to a foot of water! (one side was about 30cm's lower than the other). During most of the storm you couldn't hear the thunder over the roar of the rain and wind. Finally the wind began to die off (rather suddenly actually), although the heavy rain continued for some time. A short time later my sister tried to get into her room, but when she tried to open the door it would not budge! This is when I realised that I had forgotten to close the window in her room! Dad practically had to kick the door in. The whole room was dripping wet, every square inch. The window had not been blown in, but 'sucked out' so to speak! and the window would not close again either, and it had to be taken off it's hinges (which were bent to buggery). After the main storm passed we were treated to hours and hours of close Cg's and Anvil Crawlers of epic proportions! I have seen distant lightning shows that equal that night, but to this day I have never had such a long period of very close lightning. When the rain finally eased off to moderate, we ventured out into the street to see how much damage had been done. The devastation that awaited us was mind blowing. Our street had come off remarkably well, with only a couple of houses unroofed or damaged, a few large trees uprooted and our next door neighbours solar hot water panel ripped from their roof (which was the sound of breaking glass that I could hear), but when I walked up to the top of my street, which was on the top of a hill, and looked at my suburb looking like a warzone, I could hardly breath. Huge trees were laying all over the roads, power poles were down all over the place, and I even saw someone's carport roof laying in the middle of the road in the distance! We were without power all night, and we couldn't drive further than the top of our street until after midday the next day because of all the trees down. The end result from this storm was 2 people dead, over 500 houses unroofed, 1000 damaged and 15 declared structurally unsafe. What a storm.